So one thing I haven’t mentioned so far about the pregnancy is that for the first three months I COULD NOT KNIT. Let me pause for dramatic effect. Everytime I thought about knitting I felt so incredibly sick. PLUS my brain felt so foggy that patterns that would have previously been a piece of cake suddenly felt impossible and unmanageable. Of course the extra fun thing was that we weren’t telling anyone, and so i would turn up to knitting week after week with my garter knit washcloth, do a few rows then rip them all out when I got home. And as someone who will cram at least an hour of knitting a day (even if it’s in tiny snatched five minute segments), not to knit at all was horrible, because it’s what i do, and suddenly what i did was making me feel incredibly ill. So yeah, I REALLY wanted to blog about it then. But I couldn’t. But luckily it’s better now. Which brings me back to bees. I have been knitting for my female relatives for the last couple of years. My mother-in-law got a kiri, as did my grandma, and my other grandma – nannan – got a faroe shawl. And my poor mum is last on the list. So this year is my mother’s year! Only then I couldn’t knit for months. However, her birthday is in three weeks time, and is going to be totally overshadowed by her mother’s 90th birthday which is two days before. But she will get her knitted stole. But I’m picky about my stoles, and – right now – extra picky about my knitting. I needed something that was complicated (but not too complicated), something i could complete in a month, and that would give my mum something to show off to her friends. 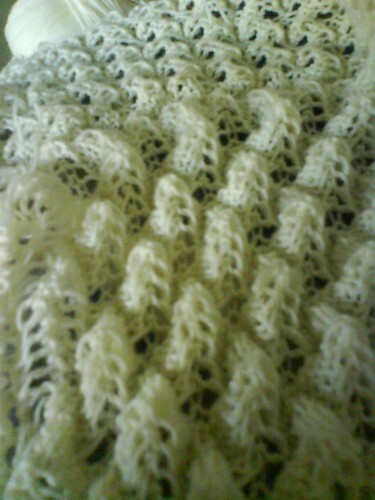 So eventually I picked the Bee Stole from Knitspot, which I’d been eyeing as a good knit for a while. Only I wanted to make it smaller, and with 4ply. So I took the pattern apart, did a little maths and realised I could remove a couple of repeats in the width, and come out with something both do-able and the right size. I have four balls of Jaeger baby merino in cream, and I’m onto my second ball, and nearly at the end of the second chart, and – as long as i keep plugging away (I’m re-watching/listening to my skateboarding dvds), I’ll have it done in no time.